As I understand it, tenkara angling developed in Japan over 300 years ago as anglers pursued smaller fish in high-gradient mountain streams. It was an efficient way for market fishermen to pursue their target species in specific circumstances. When tenkara was introduced to the States about a decade ago, Americans began adopting and adapting this style of angling in ways that it was never used in Japan. We started using keiryu rods with American-style flies, or we used fixed-line rods with live bait, or we used tenkara rods with floating, western-style fly lines, or we pursued warm water species, such as largemouth bass and catfish, with tenkara rods. Or we fished in mountain streams for American trout, which is close to original tenkara. This led to a vigorous debate. What is and isn’t tenkara? Is tenkara limited to fishing unweighted, sekasa-style flies, with a cork-handled tenkara rod, in high gradient streams? What do you call it if you tie a wooly bugger on to a keiryu rod and go after bass? And how about all those fishermen who pursue various panfish, such as cichlids and bluegills? Well, friends, it’s just American Tenkara. Other names are too long to be handy, and “tenkara” is the name that sticks. American Tenkara is what we do here with telescoping, fixed-line fly rods; and it’s different than the way tenkara fishing is practiced in Japan. It’s broader and more adaptable to fit our wide-ranging angling opportunities. It’s fishing for beautiful cutthroats in a mountain stream, if that wonderful angling opportunity is available to you. It’s pursuing bull-nosed cichlids in a suburban creek, if that’s close by. It’s going after Guadalupe bass or catfish, in you live in the South. It’s adapting and using tenkara-style rods in your home waters so that you can enjoy recreational fishing in a unique, peaceful way. American Tenkara is simply a broader definition of the original term as adapted and applied in this country. Surely we can live with this and enjoy the fishing. As an illustration, several weeks ago, I visited the upper Guadalupe River just north of San Antonio. I don’t have any high-gradient mountain streams with trout that I can fish nearby. I do have a beautiful stretch of warm river water to enjoy, less than 45 minutes from home. That evening, I carried a small tin of Utah Killer Bugs and a Tenryu Furaibo TF39, which is about as pure a Japanese tenkara rod as you’ll find. Right at dark I hooked a nice channel catfish on a size 12 brown Killer Bug and fought him for several minutes before finally bringing him to hand for a few photos. It was a tremendously exhilarating fight in a wonderful river in a beautiful setting. In fact, it was the most fun I’d had in a long time. 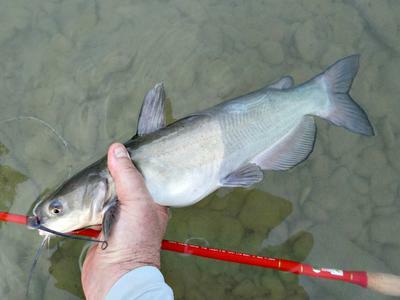 What do you call landing a channel catfish . . . in the upper Guadalupe . . . with a Tenryu Furaibo TF39 . . . on a size 12 Killer Bug? American Tenkara. John - I have the answer! You forgot there are crazy people like me who like and prefer if at all possible to fish with "garden hackle" flies better known as red wiggler worms. Thanks for the write up! I am enjoying my Tenyru rod, and if the thunderstorms would stop, I would get out and fish American Tenkara with my traditional Tenkara Rod. "American tenkara" is just another way to catch fish. I have caught fish with flies and a Kast-a-bubble on a spinning rod, fished with small spoons on a Tenkara line and rod, and everything in between including silly trout on a fly that was so battered that it was down to pretty much bare hook. The fish don't know what's on the other end of the line! I kind of feel sorry for folks who are locked in to only one way of fishing. As I continue to explore and fish the urban streams and rivers around where I live using Tenkara-style casting with Keiryu rods (ranging from my Shimotsuke Kiyotake 18 up to the Suntech Field Master 39) and fluorocarbon level lines, I've also become increasingly aware that the way I fish doesn't fit into any particular, well-defined catergory of Tenkara/Keiryu/Czech Nymphing. I know for sure that I'm certainly not practicing 'Tenkara' in its pure, Japanese form, even though I've caught a few fish on traditional (western) dry flies recently. As for 'Keiryu', as it's described by Chris, I'm not doing that either, although I often pinch non-toxic shot onto my tippet when I feel like I need to get the fly to sink faster/deeper. And even though my fly-of-choice is typically a small tungsten-bead nymph I don't think I'm a Czech-Nympher: tippet breaking hook-ups, both on natural stuff such as fallen tree branches, as well as discarded human/industrial waste, are a constant danger on the nearby rivers, so I'd rather just lose one fly at a time rather than the two, three, or four that make up a typical Czech-Nymphing setup. 'American Tenkara' seems a reasonable way to describe these various techniques (particularly as I've absorbed most of what I know from the Tenkarabum website) but I can't help myself thinking of it as 'Tenkeiryu'. When You're Asked . . . I can identify with your note. I think what prompted me more than anything else to say "American Tenkara" is that I'm sometimes asked on the river or creek, "What kind of fishing is that? Are you fly fishing? Why isn't there a reel? Is it a cane pole?" Fish long enough with tenkara/keiryu rods, and you get those questions. People usually just want a one or two-word answer, and more of them now have at least heard of tenkara. But, as you say, it's not exactly tenkara as practiced in Japan. So, I've just been saying, "American Tenkara." It's kind of a verbal short-hand. Then, I let them handle the pole, if they want to, and you can see their eyes light up! The other day I went out with my Kiyogi 21 and did some bass fishing. However, the main reason for the outing was to test out the possibilities of water-loaded casts (aka roll/Spey/Skagit/Scandi) with a long, stiff fixed line rod. I made up a line using 15 feet of 0.042" (30-lb) floating shooting line + a 5 foot sinking poly leader. Sure enough, you can do a roll cast with this combination! Even better, it will cast and turn over a medium-sized Game Changer articulated streamer! Now I don't have to worry about tree branches on the back cast when I'm after bigger game like wipers or big bass. Oh, and I caught two largemouths, one a healthy 4-5 pounder and missed a big wiper by striking too early as I saw it rush the fly. Was any of this "tenkara"? Even I, who embraces a pretty wide definition of tenkara, would hesitate to call this tenkara. However, it was a ton of fun!